iSmoothRunRun farther, Run faster, Train smarter. Version 6.0.0 on the app Store! All audio cues supported by the Phone app are available in the watch app. The same settings apply. HR coaching, Pacing, Statistics, Intervals and workouts, all work as with the phone app. Metronome is not yet supported due to WatchOS limitations, but we hope this will be available in a future WatchOS update. Footpods, Cycling sensors, Cycling power meters are supported. HRMs could be paired through apple’s interface in watch’s settings or from within the app. If a HRM is paired in the app, then the “Use HRM option” in phone app->settings->Displays->Apple Watch should be turned off. 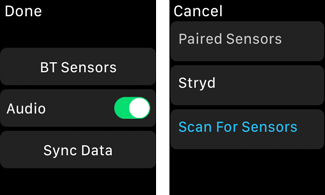 Up to two sensors can be paired at the same time with the Apple Watch. In order to pair a sensor with the watch you have to pair it with the Phone iSR app first. Settings like “Correction factor” and “Wheel diameter” are set in the phone app. One with one large metric and two smaller, and one with four metrics per page. Please setup your watch pages again in settings->Displays->Apple Watch->Setup. Audio messages now are using Siri and not pre-recorded messages. Although I would like to keep pre-recorded messages as they are more natural than siri, I needed to keep only siri so I can extend the messages in the future. Having to record messages with a Voice artist makes things harder. Added support for iPhone X display. Audio messages for Italian and Dutch are added. Average power in Split metrics is added. The notorious, shoe missing mileage is fixed. Many other fixes and improvements. With this update the Apple Watch app can be used as the primary recording device of your runs. We have been using more and more the watch as a recording device. So you can expect more development on it. Of course everything will be available on the phone app as well. But the way things are with Apple's devices the primary use case is using the watch as a recording device and the Phone as a review/communication device. There will more features on the phone regarding statistics, log view, planning, training setup, and connectivity. Thank you for your support. If you experience any problem please contact the developer through the “Feedback” option in the app. Version 5.8.0 on the app Store! The Apple Watch Stand Alone iSmoothRun is finally here. Leave your phone at home, run only with your watch and enjoy iSmoothRun. The Apple Watch app can know operate in two modes, either as a display for the phone app “Watch + iPhone”, or as standalone recording device “Watch Only”. You have two customizable screens with three metrics each, on both modes. You select the recording mode after you force touch the screen and tap “Start”. You can also set: “Activity type” (Running, Cycling etc), “Workout” (Free or any of the custom workouts created on the phone), and the “Shoes” that you use for mileage tracking of your shoes. During workouts that app will pop up a notification screen at the start of each interval with information about the forthcoming interval. An info screen with interval statistics will pop up at the end of the interval. These pop up screens are dismissed automatically after 15 seconds. There is a pop up screen with statistics at every split (Mile or KM depending on user settings). All these pop up screens/notifications will also vibrate the watch and emit a sound. You are advised to not have the watch in silent mode, as vibrations are not strong enough. The run is transmitted to the phone and saved as soon as the watch connects to the phone and the watch iSR app becomes active. iSmoothRun now supports on the phone app full metrics for two new advanced footpods: Stryd and MilestonePod. “Contact Time”, “Vertical Oscillation”, “Form Power”, “Leg Stiffness” are supported for Stryd while “Stance Time”, “Foot Strike”, “Leg Angle”, “Rate of Impact” are supported for the MilestonePod. They can reviewed after the run in the summary page. Mean values are calculated for the complete run and for each split. You can also check them in the charts of the run by tilting the phone. Display of these metrics on the dashboard of the phone or watch during the run is not yet supported but it’s in the plans. Various bug fixes and improvements of the app. Version 5.6.0 on the app Store! There is a new version on the app store that finally works with the Apple Watch. Developing for the Apple Watch during the last year has been a very frustrating experience due to Apple’s restrictions. With Watch OS3 Apple finally removed these restrictions. I am very happy to say that Apple Watch is finally usable and enjoyable. The watch app has been updated for Watch OS3 and the app can run in the background. The display gets updated really fast (well it still needs a split second, but we can live with that), and HR values are recorded in real time. The most requested feature for the Apple watch app has been to be able to “stop and save” from the watch. This was added, so now after you pause a run you can either resume it or stop and save it. There are still some issues regarding the interval/split notifications but they will hopefully be resolved with the next updates of Watch OS. Stand alone operation of the Apple Watch app is not yet supported but it is scheduled to be developed by the end of the year. Both GPS and treadmill modes will be supported. Support for the forthcoming Pebble 2 has been added too. The pebble app will be updated to utilize Pebble’s HRM. Stay tuned for more information on this. Version 5.0.0 on the app Store! iSmoothRun is the app that supports more hardware than any other. Apple watch could not be missing from our list. As with Pebble and Echo you can customize the metrics you see on the watch on two pages. Notification pages are presented for “Laps”, “Splits” and “Intervals”. When not running you can see your daily stats for the last week on page one and your last four weeks on page two. For the moment Apple is very restrictive regarding what features of the watch we can use. This will hopefully change in the future and we’ll be able to use its HRM, vibrations and buttons. Using Intel’s technology SMS created a pair of earphones that have a build in HRM! No battery or charging needed. We are happy to support it. One new setting that is worth mentioning is in the advanced settings and has to do with the use of Apple’s pedometer. It has been noticed that in the latest updates of iOS (8.3.x) Apple’s pedometer performance deteriorated. This causes sometimes wrong cadence statistics (usually lower) and non-smooth cadence charts. If you experience this problem on a 5S or 6/6Plus you might want to try this setting and use the app’s pedometer instead. Version 4.8.0 on the app Store! Version 4.6.2 on the app Store! Version 4.6.0 on the app Store! Version 4.4.2 in the app Store! Version 4.4.0 on the app Store! Version 4.2.0 on the app Store! Version 4.0.0 on the app Store! Version 3.8.1 on the app Store! Version 3.8.0 on the app Store! Version 3.4.0 on the app Store! Version 3.2.0 on the app Store! Version 3.0.0 on the app Store! Copyright © 2011-2018 Lake Horizon Ltd. All rights reserved. Trademarks are properties of their respective owners. Website by Irma Scheer.